Prior to losing a three-set semifinal to eventual champion Andy Roddick in 2012, Isner twice finished runner-up to Mardy Fish. The former UGA Bulldog and crowd favorite lost in a third-set tiebreaker in 2010 and in 2011 he had two championship points against Fish in the second set. Perhaps the one time Isner should not have been the last man standing, though, he finally got the job done. 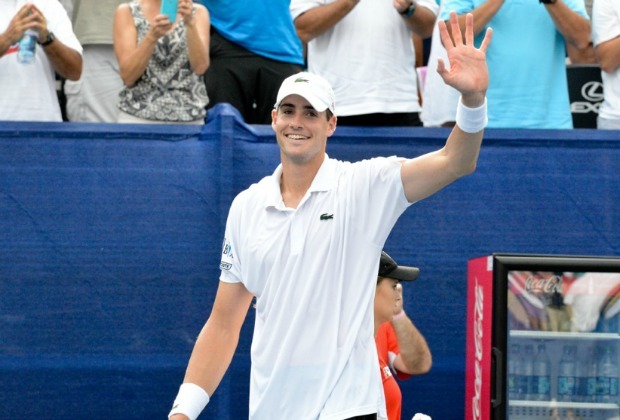 Isner played his fifth, sixth, and seventh tiebreakers of the week in what was his third three-setter in four matches as he edged Kevin Anderson 6-7(3), 7-6(2), 7-6(2) on Sunday afternoon. In the tallest ATP final in tennis history, both players held serve the entire way and combined to save 12 of 12 break points. Anderson earned 11 of those 12 those chances, but he could not convert–not even when he held a 0-40 advantage with his former college rival serving at 0-1 in the third. The second-seeded South African had two championship points when Isner served at 5-6, but he struck an errant backhand on one and Isner erased the other with a huge serve. Already a borderline final-set tiebreaker legend, the world No. 22 promptly dominated the decider seven points to two. Lasting two hours and 54 minutes, it was the longest best-of-three ATP final to date in 2013. “This is a tournament where I could’ve been out in my first match,” assured Isner, who outlasted Christian Harrison 7-6(9), 4-6, 7-5 before beating James Blake in two tiebreakers and Lleyton Hewitt in another third-set ‘breaker. “I lived on the edge all week and seemed to come through each and every time. It’s very encouraging. I’ve been on the wrong end of a final that close before; maybe not three-tiebreakers close, but super close, having match point, having a lot of chances…so it feels good to be on the other end of that. I never wavered. I believed that even at 0-40 that I could still hold on and was able to come up with the goods.